In the past few years, contact center software providers have been focused on introducing new channels for support and communication. We saw the introduction of web-based chat a while ago, but more recently text-based SMS support. Self-service options have grown with both in-app support, online databases, and even the new chatbot craze. The whole idea came together to create an omni-channel, or cross-channel, experience. But it’s important to step back and ask: is all of this effort returning the expected results? Are consumers happier, more satisfied, and taking advantage of the new channels and self-service options? I’m sure we all have some customer service horror stories, but besides basic anecdotal evidence and some general customer service statistics, it can be difficult to measure abstract concepts like customer satisfaction. Except, it turns out, that inContact went out and did just that. 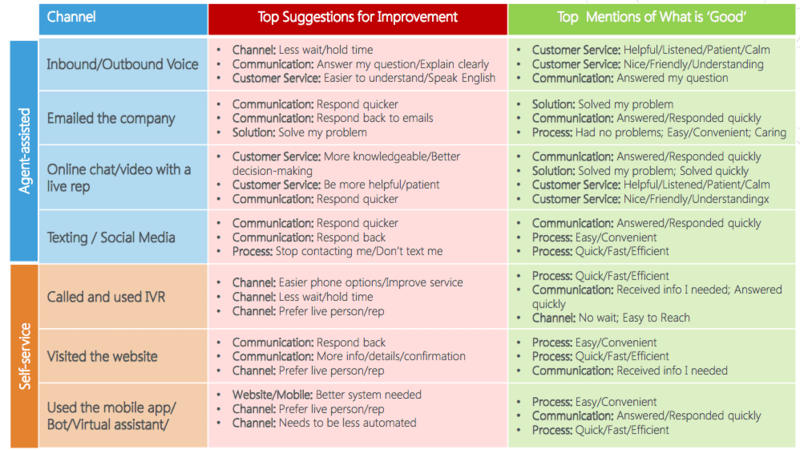 Surveying consumers on 4,700 unique interactions across different inbound and outbound support channels, the provider put together a Customer Experience Transformation Benchmark in an attempt to find out. inContact explains that the whole purpose of this study was to measure consumer satisfaction throughout different channels of customer service. Throughout March 1-13, 2017, research was conducted by MartizCX through 718 online surveys using a consumer panel. To keep information results of the study, the focus was placed on consumers who had a customer service experience up to three months prior to participating in the survey. Overall, the results might be somewhat disappointing to those investing heavily in areas other than phone support. However, that isn’t the key takeaway here. 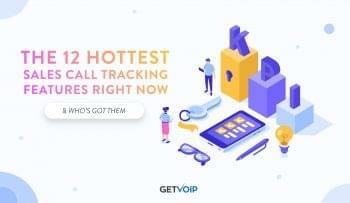 Rather, businesses should leverage the findings here to improve existing channels, and bring other methods and experiences up to par with phone support. 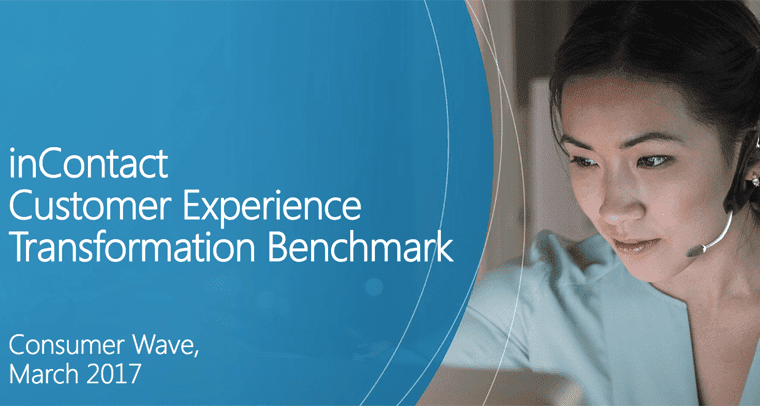 Spanning 15 different industries and focusing on 9 different support channels, inContact put together a fairly comprehensive benchmark on customer experience and satisfaction throughout numerous contact centers. inContact makes what they assert to be one of the largest findings of the entire report fairly clear. Consumers simply want a quick resolution, and will utilize any channel or method they need to reach that resolution. More importantly, consumers feel that phone support is the quickest way to reach their desired outcome. 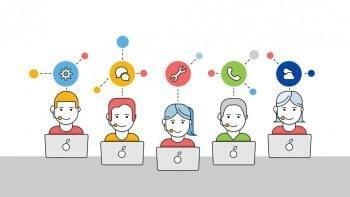 Simply put, consumers would prefer to call a company and speak to a live representative. This dominated the majority of interactions in the report and even accounted for two-thirds of every point of contact included in the survey. So, knowing that all a consumer cares about is an easy and quick resolution, we can look at the rest of the results under the same lens as the consumer. Unfortunately, the results don’t look too promising for the business hoping to keep things the way they are. Now, this doesn’t mean every business should up and panic. But it does serve as a solid indication of what the consumers want, and how to best position support to improve a customer’s experience. 8 in 10 consumers are willing to switch companies due to poor service. Less than half of the consumers surveyed were satisfied with their experience. 67% of consumers still prefer agent-assisted support either by phone, chat or email. Only 33% of consumers prefer self-service options. 72% expect companies to know their purchase history regardless of the channel used for communication. But despite the preference for agent-assistant support, the study also concluded that less than half of the consumers surveyed were satisfied with communication through both agent-assisted and self-service channels. 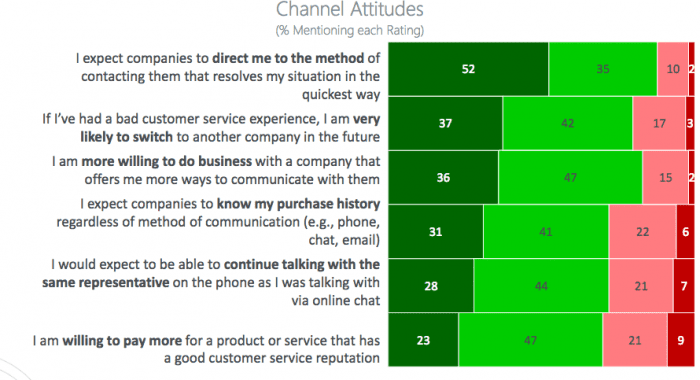 Overall, these results “confirmed that delivering excellent omnichannel customer service continues to be a major business pain point, revealing key areas where companies are not meeting consumer demands.” So we know that consumers prefer agent-assisted methods, and we know that consumers want a quick and easy resolution. 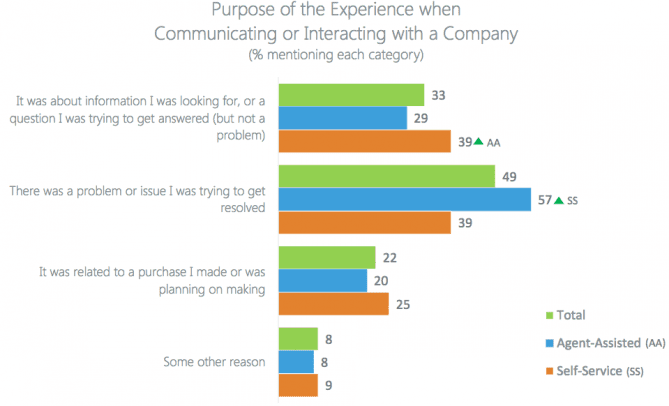 Consumers feel the best way to do this is by speaking directly to a live representative. 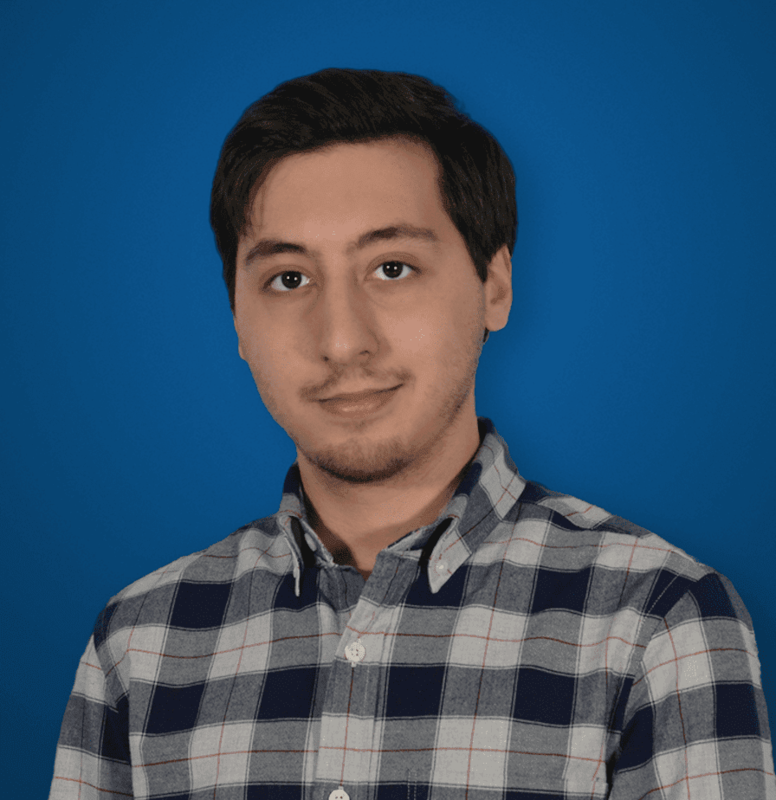 But of course, there are now multiple channels where this method can be applied to — so we’ll look closely at how the different channels compare. As we’ve seen the call center evolve into the contact center, one of the major distinctions between the two is the introduction of new, digital channels and methods of communication. Over the years we’ve seen centers grow beyond just inbound and outbound phone support, but add unique options like email, online chat, in-app support, texting, and even sometimes faxing. We’ve also seen chatbots blow up as a new interesting technology that many, including myself, have declared as revolutionary. But, if no one wants to even use these new channels, is the investment worth it? Businesses are trying to go where the consumers are, hence why Facebook Messenger — which alone has the largest user base of any platform — and texting have become two major focus points. So then the question becomes: how are consumers reacting, and are these new channels and methods being utilized? As I mentioned before, users — 66% of those surveyed, in fact — are pretty much sticking with phone support. What is interesting is that the preferred method of contact we notice is through phones — especially with millennials so focused on chat-based communication — whether it be email, SMS or web chat. As we saw above, the satisfaction is higher with online chat and video above voice, yet voice is still the most utilized channel. We’ll dig into this a bit later, but a logical explanation is that people simply prefer the nuances of a voice conversation to that of a text one. Another distinction I want to touch on is one we notice in the graph above: the difference in self service and agent-assisted channels. As a new trend, contact centers are investing time and money into developing these complex and comprehensive self-service options for consumers. The idea is that if a consumer can solve the issue and locate information easily online, or directly in an app, they won’t even need to pick up the phone. But as we saw, consumers surveyed seem to prefer agent-assisted channels to self-service channels. However, the important aspect is that consumers will utilize the different channels for different reasons, which is kind of the point. So that’s a good sign; users who simply need information will go self-service, but those with problems are still calling in. We can see here why consumers prefer different channels and methods. That’s the main argument behind chatbots, as well. If you have an army of self-service bots acting as your first line of defense, a contact center doesn’t need as many agents, and the few they do use can be better utilized dealing with complex issues. But consumers have a unique list of what they do and do not like about each channel of communication, as well as method when it comes down to agent and self-service. Agent-assisted methods do well on answering/responding quickly to customer issues. But response time is a downfall for many, too, with that being a leading area of improvement suggestions. Self-service methods are praised for being easy, convenient and efficient in providing the information customers need. However, each of the specific channels – at times – leaves customers desiring interaction with a live rep.
And this all makes sense. An online database to identify a problem is helpful, but if the consumer can’t fix the problem or needs a replacement product, they still need to talk to an agent. So the best way for a business to improve this gap would be to integrate their self-help options with agent-assisted channels. This could be as complex as a chatbot that collects information and routes consumers based on priority, or simply a “click here to talk to an agent” button the bottom of a help article. The best way to integrate this would be to keep context. That was another important takeaway, users want agents to know their history regardless of channel. In the case of a simple click to contact button, depending on the help-page the consumer is on, the agent will be aware of from where the consumer began reaching out from help. Regardless, as we know already, phone support is absolute king still in Contact Centers. This study has revealed that despite the efforts put into self-service and other channels, phone calls still remain to be the most common method consumers will utilize to contact a business when they need help. Again, the main focus of consumers is simply to have their issue solved right away, and based on the findings here most consumers feel that talking to a live agent on the phone is the best way to resolve a problem as soon as possible. It makes sense when you think about it, email is a mess of back and forth usually with long waiting periods and insincere, canned replies — there’s a reason most businesses are switching to team messaging over email — and chat, while instant and quicker than email still lags behind a live conversation on the phone. Again, there’s a reason teams will still use voice or video conferencing for very urgent matters or crucial meetings. Voice channels generally take longer, with holding and wait times so consumers are less likely to want to call in, just to have a 15 minute wait. But once they do get on the phone, consumers found agents were more helpful and listened closely while remaining calm and patient. Consumers considered phone agents to always be nice, friendly and understanding. Overall, they felt a human interaction and felt like their problem mattered. Overall, the communication generally leads to the question being answered or problem solved. The reason phone stands out among other channels, such as email and online chat, is that they feel far less personal. 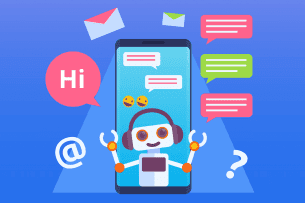 Email specifically is known for long response times, and generic responses, meanwhile chat can prove difficult for consumers to explain their problem adequately, and also suffers from the generic responses and lack of personalization. One of the key takeaways here is what makes phone support so successful, despite the pain points consumers feel. They would rather wait on hold, to speak to a live human agent in order to receive personalized support, but also feel that human, emotional connection. Talking to a person allows us to of course easily articulate the issue through voice, not text where emotion and priority are lost, but also feel as if our problem actually matters, and is being resolved with the attention it deserves. Now it is important to note that one of the complaints about phone service was a lack of concern and sincerity, but this was echoed throughout the other options, for online chat they complained of generic responses, and in email they complained of the support feeling too impersonal. Overall, phone offers the happy-medium. Now, this isn’t to say that Phone Support doesn’t have its own downsides. Of course it does, this is why users prefer to web and online chat over phone, even though they feel less satisfied. Overall, consumers generally just don’t want to talk on the phone, but more importantly they hate the barriers between them and an agent. One of the largest complaints consumers had about phone support was the dreaded IVR system. 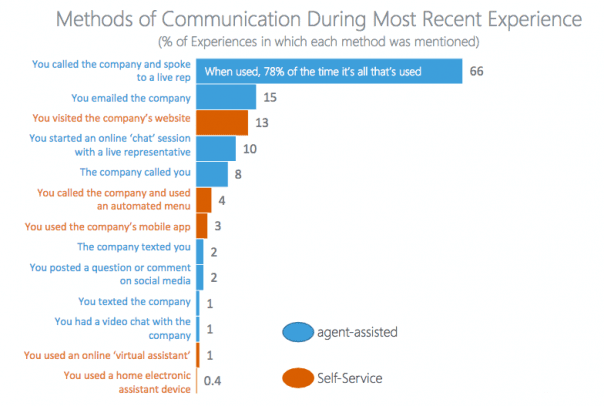 Most users simply stated that they would prefer to be connected to a live agent, not have to slow down and run through a generic voice response system. In a personal anecdote, whenever I get on the phone I always scream “agent” at the IVR until it finally gives up. I wrote a post about how your IVR can be improved for an omnichannel experience, but here lies the biggest barrier. Agent sincerity is an easier issue to tackle, better trained agents will understand how to respond to upset consumers, and looser scripts can remove that robotic feel. AI will even help agents directly by being able to analyze how a caller feels, and supply appropriate responses and resolution paths. But the IVR feels like an unnecessary evil — there must be a system to direct callers to the best agent, and supply some kind of context to the call. The key takeaway here is how we can improve or even replace the IVR. Minimizing the length of interaction and necessity of the IVR is one way to help consumers — simply provide an option to reach an agent right away, or keep the menus very compact and simple. Going even further, the combination of channels I recommended above can help supply the context, which is an important part of the equation. Extra channels are no-good if consumers do not even properly utilize them, or feel satisfied with the resolution. Chatbots are useless if everyone ignores them or rushes through and tries to grab an agent as fast as possible. No one wants to use email if they feel like they’re going to have to call anyway. By understanding the major pain points that both businesses and consumers feel, teams can work on smoothing out the rough points in the customer’s journey. The whole idea of the omnichannel-experience is opening, and connecting, numerous channels. Digital is incredibly important, and consumers do prefer the digital methods. However, if the support is not up to par, they will run away. Without a personalized, sincere, human driven interaction consumers simply feel like their voice doesn’t matter. What is obvious is that the customer experience is incredibly crucial. We know consumers will switch companies if they are not happy with the help they receive, and the level of service. Unfortunately, some of the natural downfalls of different methods lead to consumers abandoning them, but that doesn’t mean they cannot be improved. Online chat can be annoying to type into, but agents who do not stick to a script and use the same generic greeting messages can help consumers feel more appreciated. Treating the conversation like a friendly text will help consumers feel that personal feel. But typing can still prove as a barrier — so why not simply include a “click to call agent” button right inside the chat? Now some of this is held back by tech, but things like WebRTC will make this incredibly possible. Just look at what Amazon did with Mayday. They included a WebRTC based video pop-up with an agent directly on the device itself. This example is a key one to highlight how we can bridge together the channels and make it easier for users to reach the level of support they need. But, the first step of course is to identify a problem, and where it exists, before we can tackle it. InContact gave contact centers a big head start on that one, now the real innovation should follow.